Friends of Dyke Marsh is a volunteer group dedicated to preserving, restoring and enhancing Dyke Marsh, a freshwater tidal marsh in Fairfax County on the Potomac River just south of Alexandria, Virginia. The Dyke Marsh Wildlife Preserve is administered by the National Park Service. The Dyke Marsh Wildlife Preserve is a freshwater, tidal marsh on the Virginia side of the Potomac River in Fairfax County. It is a unit of the George Washington Memorial Parkway, U.S. National Park Service. For more information, visit the NPS website at www.nps.gov/gwmp. On October 11, 2015, 29 members of the Nelly Custis Chapter and other chapters of the Daughters of the American Revolution (DAR) turned out in force to help in the Dyke Marsh Wildlife Preserve (photo left by Robert Smith). Under FODM Vice-President Ned Stone's direction, they split into three groups and cleaned the shoreline of an island and the Belle Haven picnic area and took on invasive plants on the dogleg portion of the Haul Road trail. The eager group collected around 58 bags of trash. "It makes a difference," wrote FODM Treasurer Robert Smith. FODM and the National Park Service (NPS) have undertaken a project to save some of the preserve's pumpkin ash trees (Fraxinus profunda) from the emerald ash borer (EAB) (Agrilus planipennis), an invasive insect that has been documented in Northern Virginia and will kill all species of ash trees, according to U.S. Department of Agriculture experts. On September 28-29, 2015, National Park Service (NPS) and U.S. Army Corps of Engineers (COE) officials met to begin the design of the restoration of Dyke Marsh under a NPS-COE interagency agreement. Officials estimate the design phase will take at least 12 months. On September 27, 2015, the Friends of Dyke Marsh had a table offering Dyke Marsh information at Earth Sangha's semi-annual native plant sale held at their garden in Springfield. We participated alongside other groups, including the Friends of Huntley Meadows, the Friends of Accotink Creek and the Arlington Master Naturalists. On the lovely, warm, sunny day of August 8, 2015, I led 19 ecology students and professional ecologists and one child for a too-abbreviated visit to the Dyke Marsh Wildlife Preserve (DMWP), as part of the special 100th anniversary meeting of the Ecological Society of America being held at the Baltimore Convention Center. Pollinators visit flowers for nectar and pollen and when visiting flowers, they move pollen from one flower to another of the same species to produce fertile seeds. Most flowering plants are pollinated by bats, bees, butterflies, flies, beetles, and other animals. Plants can also be pollinated by wind and water and self-pollinate. Animal pollinators face many challenges, including pollution, pesticides, habitat loss, invasive plants, disease, parasites and climate change. On April 14, 2015, FODM and the National Park Service led a group of Iraqi officials and scientists on a walking tour of Dyke Marsh. FODM is honored to have had these visitors. FODM president Glenda Booth has written an article that was published in the April 22, 2015 Mount Vernon Voice newspaper. Click here to view the photos and read the entire article. U.S. Secretary of Interior Sally Jewell on October 24 announced a grant of $25 million to the National Park Service to restore Dyke Marsh, which is eroding six to eight feet a year. The funds are part of the Obama Administration's Hurricane Sandy Rebuilding Strategy and Climate Action Plan to build resilience by restoring natural features along shorelines and protect communities from future storms. Dyke Marsh restoration is one of 25 projects that DOI selected for funding out of 94 submitted. Click here for a video of Secretary Jewell's visit to Dyke Marsh. Producers of This American Land chose the Dyke Marsh Wildlife Preserve as one of America's little known but special places. We agree. View a video of it. "Our" osprey pair at the Belle Haven marina boat ramp is featured in a 13-minute video titled "Osprey Love Nest." William Young, an Arlington writer, shot the footage and wrote the script. Ashley Bradford, an artist who lives near Dyke Marsh, does the narration. The video provides information about the behavior, anatomy and field marks of the nesting pair, as well as their interactions with other birds in the marina. He has shot other videos featuring egrets, coots and earned and horned grebes in the area which are on his page. FODMer Laura Sebastianelli is monitoring beavers in the western part of Dyke Marsh, behind River Towers. On May 1, she spotted two families, two adults and a kit and two adults and two kits nursing. At one point, she saw five adults and three kits on top of the lodge and at least one beaver swimming around. Thank you, Laura. This is a very special, little-visited part of Dyke Marsh. Ten enthusiastic Girl Scouts from Troop 2459 visited the Dyke Marsh Wildlife Preserve on April 28, 2015 and cleaned up trash along the shoreline. They are working on an animal habitat badge. Their troop leader is Sarah Olson and they are based at Fort Hunt Elementary School in the Mount Vernon area. FODM President Glenda Booth, Vice President Ned Stone and FODMer Patty McCarthy talked about the harm of trash on wildlife and habitat. Meetings are held four times a year. The remaining three meetings in 2019 will be on Wednesdays at 7:30 p.m. at the Huntley Meadows Park Visitor Center, 3701 Lockheed Boulevard, Alexandria, VA 22306. FODM will host an informal social 30 minutes before each meeting. FODM, Secret Gardens Birds and Bees and the National Park Service will "host" live raptors, 10 a.m. to 12 noon, Belle Haven Park. Free. 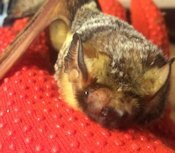 Join FODMer Deborah Hammer for an acoustic survey of bats in Dyke Marsh, April 27, 8:00 p.m. For the location and to RSVP, email deborahkh@netscape.net. The Sunday, April 28, 8 a.m., bird walk will move to Huntley Meadows Park, North Kings Highway entrance. The National Park Service will close the GWM Parkway for a race, 6 a.m. to 10 a.m. FODM Sunday, 8 a.m. bird walks will resume on May 5. Help restore degraded habitat and plant native plants in Dyke Marsh on May 6 (rain date, May 13) 1 to 4:30 p.m. Meet at the Haul Road trail native plant site. Wear gloves, long pants and sun protection and bring water. Please sign up at info@fodm.org. Learn about sea level rise’s local impact from NPS biologist Geoffrey Sanders. 7 p.m. informal social. Huntley Meadows Park, 3701 Lockheed Blvd., Alexandria 22306. Join FODM on June 9, 10 a.m., for an ecology walk led by naturalist Charles Smith. Meet at the Haul Road trail entrance. FODMers lead bird walks every Sunday morning. Meet at 8 a.m. in the south parking lot of the Belle Haven picnic area. Walks are led by experienced birders and everyone is welcome to join us. The Sunday, April 28, 8 a.m. bird walk will move to Huntley Meadows Park, North Kings Highway entrance. Your contribution will help us preserve and restore Dyke Marsh and support special programs and studies. Thank you. Amazon.com will donate .5 percent of the price of your purchases to the Friends of Dyke Marsh if you shop through smile.amazon.com. Click on the link and sign into your account or create an account. The Friends of Dyke Marsh extend a welcome to all of our friends. Click here for an invitation to the Dyke Marsh Wildlife Preserve in Spanish, which we hope will make Spanish-speaking visitors feel welcome. We hope to see you soon. Sergio Harding banded the shrikes with a red band. FODM President Glenda Booth published an article in the May-June 2018 Virginia Wildlife magazine, titled, “What’s Going on with the Butcher Bird? Visit the website here. Sightings of this bird in Northern Virginia are rare.